“Apollo is a new, compact bushy plant. Producing delicate, feathery foliage which looks lovely and will fill out any display. This is followed by a profusion of 10cm (4”) enchantingly, ice white flowers with a golden centre, supported on sturdy, long stems. This cottage garden favourite is also suitable to grow in containers due to its compact habit and loves full sun. An excellent cut flower, which will add lightness and purity to any arrangement, and also fill the garden with charm.” Height 55-65cm (20-26”). 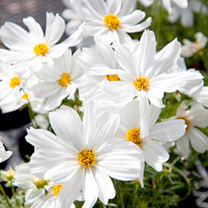 For earlier blooms, sow indoors from February-April in trays of good quality seed compost, 0.5cm (¼") deep. Place in a propagator at 15-20°C (59-68°F) or use a clear plastic bag on the windowsill. Keep the soil moist, not wet and seedlings will appear in 14-21 days. Pot on into 7.5cm (3") pots and grow on in cool, not cold conditions. Can also be directly sown in April/May, 1.5cm (½") deep in a weed-free bed. Thin to 38cm (15") final flowering positions.